Mohawk Hardwood Floors has taken the gifts of nature and crafted them into gorgeous products for your home. Whether it is solid or engineered, Mohawk Hardwood Floors has master craftsmen that bring out the extraordinary warmth along with the wood’s soothing textures and tones. Each species is unique in grain, color and character. Mohawk Hardwood Floors is available in many different styles, finishes and widths, including red oak, white oak, ash, hickory, maple and American cherry. To be better prepared and more confident in your selection a little basic understanding about the different types of products is needed. They are produced in both solid and engineered planks and strips and come in a wide variety of widths, thicknesses and colors. To ascertain which type of plank will work best for your living space depends upon which room within your home and the type of surface on which it will be installed. Solid plank is available for the consumer who wants the appearance and construction of 3/4" solid board. Solid planks are produced from premium prefinished American and Canadian species. Solid plank can usually be refinished several times over its life. Because solid planks are more vulnerable to moisture than engineered planks they should only be nailed-down above grade over an approved wooden surfaces in a humidity-controlled environment. For consumers who want a real product but do not want to be concerned with the problems generally associated with solid plank, engineered planks are the answer. This product is produced by bonding several plies together to form the planks. Most engineered planks can be stapled-down, direct glued-down or floated over a variety of surfaces including dry concrete slabs, wood and some types of existing products. 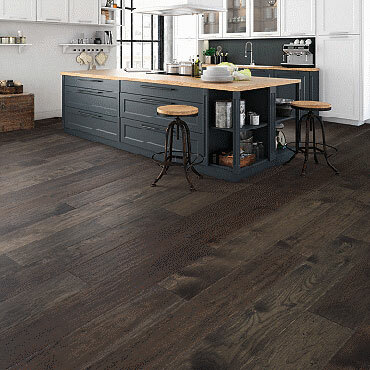 Engineered planks have cross-ply construction which reduces the contraction and expansion of planks caused by variations in humidity and allows these products to be installed anywhere in the home. Collections include premium high quality exotic species from all over the world. These products offer many unique and visually stunning appearances that will stand the test of time. The coloring of exotic species is very distinctive, characterized by a lustrous range of tones, making it an extremely decorative plank option with an exotic, high-end appeal. Prefinished planks offer handcrafted beauty and exceptional quality by using the finest hardwoods and the exclusive CrystalShield™ finish. CrystalShield™ is an exclusive Aluminum Oxide Ceramica, or natural oil finish for years of lasting magnificence and unsurpassed protection. This manufacturer warrants the original buyer, the goods to be free from manufacturing defects for as long as they own their home. Wood is a natural product and may have naturally occurring blemishes. The owner/installer of this product must use reasonable selectivity and hold out or cut off objectionable naturally occurring blemishes.